Asparagus has always been one of our favorite vegetables. Once I learned how to cook fresh asparagus I've taken advantage of doing it lots of ways. I've steamed them in a steamer on the stove top, and in the microwave. I've roasted and grilled asparagus. I've cooked asparagus with orange, ginger and sesame oil. I've cooked asparagus with a wide variety of things, ginger and apricot, parmigiano-reggiano cheese and with orange and toasted hazelnuts. 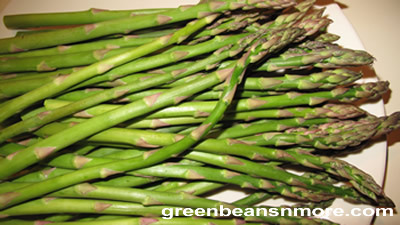 I've used blanched asparagus in salads with light and flavorful vinaigrettes. There are hundreds of easy asparagus recipes you can try that take no time at all. 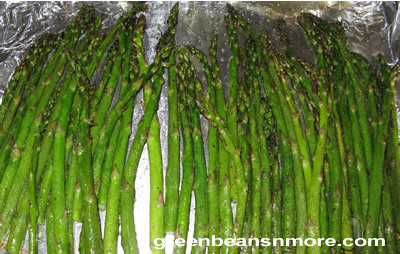 With all the great asparagus recipes I've tried over the years my favorite way to cook fresh asparagus is to roast it. Roasting asparagus with olive oil, salt and pepper is the simplest way to cook it and it brings out the sweetness and full flavor of asparagus . Snap off the stem ends. Cover a baking sheet with aluminum foil. Place the asparagus on the baking sheet. Drizzle olive oil over the asparagus. Salt and pepper liberally. Toss asparagus to thoroughly coat stalks and tips. Roast asparagus until tender. Thin spears should roast between 10 and 12 minutes. Roast thicker spears up to 15 minutes. Tips on storing asparagus: When I get the asparagus home the first thing I do is cut 1/4" off the stalks and stand them in lukewarm water. I want them to stand this way at least 30 -45 minutes before I use them. I don't buy asparagus unless I know I'm going to use it within a day or two. If I'm going to cook the asparagus in water I do very carefully rinse it in lukewarm water. When I'm planning on roasting asparagus I do not rinse it. If you do choose to rinse it make sure that you dry it thoroughly so the olive oil will stick to the stalks and tips.